Common injuries resulting from a car accident are sprains and strains to the soft tissues surrounding the spine. Damage to the muscles, tendons, and ligaments is often undetected on x-ray. If untreated, injured soft tissue could develop scar tissue, become weakened, and prone to re-injury. We treat these soft tissue injuries at our Silver Spring, MD office. Are you suffering from pain because of your injury? Learn how chiropractic can help you recover from auto injuries. 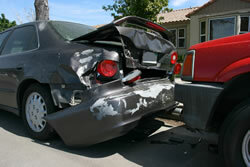 Auto injuries are a common source of chronic pain. Getting the proper treatment early after your accident can be crucial in recovering quickly. Please get the proper care you deserve.